The Mappings tab in the VPOP3 settings lets you specifically associate email addresses with users. If you don't do anything else, then VPOP3 automatically associates <username>@<domain> with the user 'username'. The <domain> part depends on the situation - for internal or incoming SMTP mail, the <domain> is the Local Domains setting, for incoming POP3 mail the <domain> is the Accepted Domains setting. So, if the Local Domains is set to example.com, then a local message to fred@example.com will be routed to the user called 'fred'. If you want to disable these default associations, then you can turn them off in the Local Mail settings or the Mail Collector Routing Options as appropriate. Mappings let you change this default association of email addresses -> users. So, you can add or override email address -> user associations. 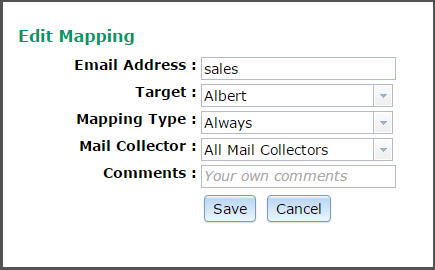 A Mapping of sales -> albert will mean that mail to sales@<domain> will be delivered to the VPOP3 User albert. You do not need a VPOP3 User called 'sales' for this to work. If you do have a VPOP3 User called 'sales', then this Mapping will stop mail addressed to sales@<domain> being delivered to that User, the mail will ONLY go to the User albert. If you want the mail to go to both users, then you will need to create a second Mapping of sales -> sales as well. (Or use a Distribution List). Wildcards (* and ?) can be used in Mappings, but note that, because Mappings take precedence, you have to take care. For instance, if your Local Domain is example.com, then a Mapping of *@example.com -> bob will mean that the User bob will receive all messages, even if they are addressed to other users. In this case VPOP3 will not deliver the message to the original recipient and also copy it to bob - it will only send the message to bob. You could create explicit Mappings for your other users to send messages for those addresses to those users as well as copying the messages to bob. There is a special 'wildcard' which can be used in Mappings - the tilde (~). If this is placed as the only thing before the @ symbol in the Mapping, then VPOP3 inteprets it as "unrecognised addresses @", so if you have two users kate and joe, and a single Mapping of ~@example.com -> joe, then messages to kate@example.com will be delivered to kate, and messages to any other address@example.com will be delivered to joe because of the tilde Mapping. The How VPOP3 determines message recipients topic contains more detailed information on how VPOP3 calculates the recipients of a message. Another special type of Mapping is a Mapping to the special *REMOTE value, for instance Mark -> *REMOTE. This type of Mapping tells VPOP3 that the address Mark exists, but is not in this VPOP3 installation. That means that if a local user sends a message to Mark@localdomain, then VPOP3 won't reject it as for an unrecognised recipient, instead VPOP3 will put the message into the Outqueue to be sent to the Internet. Also, if a VPOP3 Mail Collector downloads a message for Mark@domain from a remote POP3 mailbox, then VPOP3 will just ignore that recipient rather than treating it as an unrecognised recipient. This can be useful if you have more than one mail server handling mail for your domain. You can use *REMOTE mappings in VPOP3 for the email addresses handled by the other mail server. To add a Mapping, press the New button, and to edit a Mapping double-click on it. In the Email Address box put the email address for the Mapping. You can use the full email address, wildcards or ~ as described above, or just the name part of a local email address. In the Target box choose who you want to receive messages for the specified email address, or you can select *REMOTE if appropriate (see above). •POP3 - the Mapping will apply to messages downloaded using a POP3 Mail Collector. •SMTP - the Mapping will apply to messages received using SMTP. •FROM - the Mapping will apply to messages downloaded using a POP3 Mail Collector, but VPOP3 will check the sender's email address rather than the recipient's email address. If the Mapping Type is POP3, then you can specify which Mail Collector the Mapping applies to (or All Mail Collectors). The Comments box lets you enter comments for your own reference. At the bottom of the Mappings page are two buttons to Export the Mappings to a CSV file or Import Mappings from a CSV file.